The World Cup matters – let’s clarify that first of all – but other one-day international (ODI) series don’t. 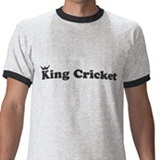 That is a new, official King Cricket editorial stance. Between squad rotation, experimentation, dead rubbers and lack of interest from fans and players, we no longer see the average ODI as being an international cricket fixture. Writing about them as such maintains the illusion and amounts to tacit acceptance of scheduling that we believe is wrong. The fans and the media fuel the game and therefore ODI coverage supports what we see as an unacceptable situation. While posts on this website form an almost unimaginably minuscule part of that media coverage, why be a hypocrite? We have nothing against the ODI format. This is all about the needlessly congested fixture list and the majority of this applies equally to Twenty20 internationals. It’s not that we’ll ignore ODIs. It’s just that they don’t matter. If there is a one-day series before a Test series, it helps build the narrative for the matches that do matter – the Tests. Those ODIs have merit in that they support the Tests, setting the scene, providing intrigue. They are like warm-up matches. That’s how we’ll treat them. If there is a one-day series after a Test series, we really will struggle. These matches might be of interest in terms of setting the scene for the only ODIs that do matter – World Cup matches – or they might offer a chance to look at a new player who might go on to play proper international matches. That’s all though. We can’t imagine they’ll get much attention. For us, an international cricket match has to be special; it has to be an event. You can’t have an event every day and this is our way of taking a stand. As an addendum to this post, in the last few months we have seen a very good website slowly die because the author became disillusioned with his subject matter. We don’t want that to happen here and we’re hoping this new policy will help ensure that we retain our enthusiasm. Are you talking about Jrod ? No. He isn’t losing enthusiasm for his subject matter any time soon. He just directs it differently. It wasn’t a cricket site. It is Google. They have lost interest in their subject matter – which is everything. Oh that’s alright then. I’ve never trusted them. They think that 1970s prog rock band King Crimson is the most important thing in the whole world that begins with “King Cri”, which is just really, really irritating for anyone interested in King Cribbage. I’m worried this is an editorial stance that’s going to be stuck to. I agree, incidentally. When the team isn’t taking an ODI series seriously there’s no reason the fans should. This is a staggeringly unfunny article, KC. The correct term is JAMODI: just another meaningless one day international. We considered making a website called Jamodu because that’s what the Npower logo on English cricket pitches looks like when they’re bowling from t’other end.